I don't see advantages of using events over delegates, other than being syntactical sugar. Perhaps I am misunderstanding, but it seems that event is just a placeholder for delegate. Would you explain to me the differences and when to use which? What are the advantages and disadvantages? Our code is heavily rooted with events, and I want to get to the bottom of it. When would you use delegates over events and vice versa? Please state your real world experience with both, say in the production code. If we use only delegate in place of Event then subscriber has the opportunity to clone(), invoke() the delegate itself as shown below in the image. Which is not right. Welcome to Stack Overflow! Whilst this may theoretically answer the question, it would be preferable to include the essential parts of the answer here, and provide the link for reference. this code works well but you could have some weak spots. Another weak spot is that every class that use your Animal class can raise RaiseEvent just calling it animal.RaiseEvent(). To avoid this weak spots you can use events in c#. Events can't directly be assigned. In this case you can't do the previous error that I have showed with overriding the behavior. No one outside of your class can raise the event. it takes a sender (of Object type) and event arguments. The sender is null if it comes from static methods. You can use event in an interface. Invocation access to the multicast delegate is limited to the declaring class. The behaviour is as though the delegate were private for invocation. For the purposes of assignment, access is as specified by an explicit access modifier (eg public event). Sample two, illustrating both direct assignment and combination assignment. Sample three: more familiar syntax. You are probably acquainted with the assignment of null to remove all handlers. 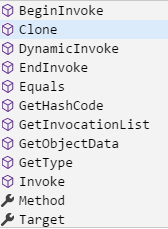 The add and remove methods are more conspicuous in the rather stilted syntax that VB.NET uses (no operator overloads). + for "Invocation access to the multicast delegate is limited to the declaring class"- that to me is the key difference point between delegates and events. Another important difference (mentioned by itowlson below) is that one can't unsubscribe all event handlers by assigning to an event, but they could do that with a delegate. (By the way, yours was the most useful answer to me of all these). Here's a delegate. Please invoke it when something interesting happens. Here's a delegate. You should destroy all reference to it as soon as convenient (and no longer call it). The most common way for a class to handle an event it exposes is to define a multicast delegate, and add/remove any delegates that get passed to the above methods but there is no requirement that they work that way. Unfortunately, the event architecture fails to do some things that would have made alternative approaches much cleaner (e.g. have the subscription method return a MethodInvoker, which would be kept by the subscriber; to unsubscribe an event, simply invoke the returned method) so multicast delegates are by far the most common approach. From the technical standpoint, other answers have addressed the differences. From a semantics perspective, events are actions raised by an object when certain conditions are met. For example, my Stock class has a property called Limit, and it raises an event when the stock prices reaches the Limit. This notification is done via an event. Whether anyone actually cares about this event and subscribes to it is beyond the concern of the owner class. A delegate is a more generic term to describe a construct similar to a pointer in C/C++ terms. All delegates in .Net are multicast delegates. From a semantics perspective, they are generally used as a kind of input. In particular, they are a perfect way to implement the Strategy Pattern. For example, if I want to sort a List of objects, I can provide a Comparator strategy to the method to tell the implementation how to compare two objects. I have used the two methods in production code. Tons of my data objects notify when certain properties are met. Most basic example, whenever a property changes, a PropertyChanged event is raised (see INotifyPropertyChanged interface). I have used delegates in code to provide different strategies of turning certain objects into string. This particular example was a glorified ToString() list of implementations for a particular object type to display it to users. Maybe I'm missing something, but isn't an Event Handler a type of delegate? My answer addresses the questions Edit #1 and #2; differences from a usage perspective. For the purposes of this discussion, they are different, even though, from a technical standpoint, you are correct. Take a look at the other answers for technical differences. "All delegates in .Net are multicast delegates"? Even delegates that return values? Yes. For history, take a look at msdn.microsoft.com/en-us/magazine/cc301816.aspx. Check out: msdn.microsoft.com/en-us/library/system.delegate.aspx. If they return values, the value that is returned is the evalutation of last delegate in the chain. delegates are reference types that points to the event handlers defined in the subscriber class. In otherwords, the delegate is used as a link between the event (in the publisher) and the event handler defined in the subscriber. In an application, there will be multiple subscribers need to listen to an event, and in such scenarios delegates offer us an efficient way to link publisher and subscribers. Although I've got no technical reasons for it, I use events in UI style code, in other words, in the higher levels of the code, and use delegates for logic that lays deeper in the code. As I say you could use either, but I find this use pattern to be logically sound, if nothing else, it helps document the types of callbacks and their hierarchy too. Edit#1 When would you use delegates over events and vs.versa? Please state your real world experience with both, say in the production code. Or so that the class can do a 'callback' (typically a callback to a method of the class which created it). These delegates are generally non-optional at run-time (i.e. mustn't be null). I tend not to use events; but where I do use events, I use them for optionally signalling events to zero, one, or more clients that might be interested, i.e. when it makes sense that a class (e.g. the System.Windows.Form class) should exist and run whether or not any client has added an event handler to its event (e.g. the form's 'mouse down' event exists, but it's optional whether any external client is interested in installing an event handler onto that event). Events are marked as such in the metadata. This allows things like the Windows Forms or ASP.NET designers to distinguish events from mere properties of delegate type, and provide appropriate support for them (specifically showing them on the Events tab of the Properties window). This helps to isolate event subscribers: I can add my handler to an event, and you can add your handler to the same event, and you won't accidentally overwrite my handler. Events are syntactical sugar. They are delicious. When I see an event, I know what to do. When I see a delegate, I'm not so sure. Combining events with interfaces (more sugar) makes for a mouth watering snack. Delegates and pure virtual abstract classes are much less appetizing. [SOLVED] What is the difference between String and string in C#? [SOLVED] What is the difference between an abstract function and a virtual function? [SOLVED] What is the difference between const and readonly? [SOLVED] What are the differences between delegates and events? [SOLVED] What is the difference between a field and a property? [SOLVED] Calculate difference between two dates (number of days)?